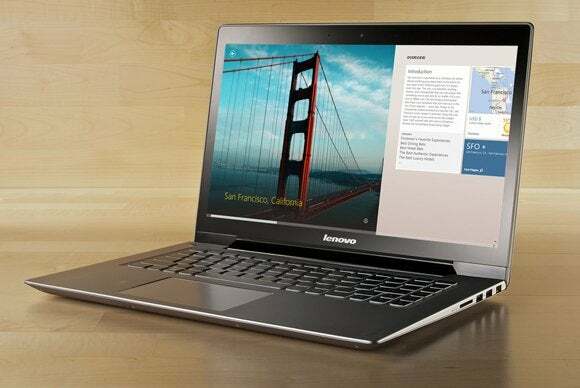 If you think an Ultrabook is out of your price range, you haven’t seen Lenovo’s IdeaPad U430 Touch. Ostensibly designed for the consumer market, the U430 carries over many of the features that render Lenovo’s corporate laptops so appealing, including a rigid but elegant all-aluminum enclosure and an exceptionally good, island-style, backlit keyboard. 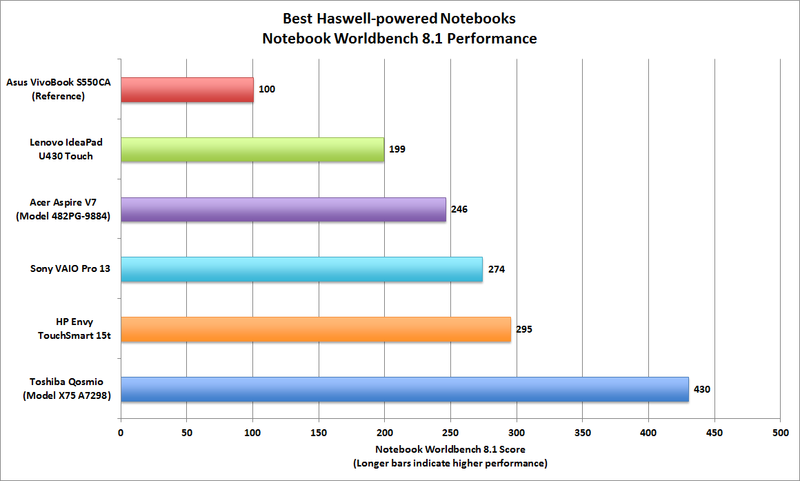 The dual-core Intel Core i5-4200U processor inside the IdeaPad U430 Touch is one of the least powerful members of the Haswell Core i5 family, but that didn’t stop this computer from delivering a Notebook WorldBench 8.1 score of 199. That marks it as nearly twice as fast as our reference notebook, an Asus VivoBook S550CA powered by a third-generation Intel Core i5-3317u. Lenovo outfits the U430 with a typical 4GB of DDR3/1600 memory. 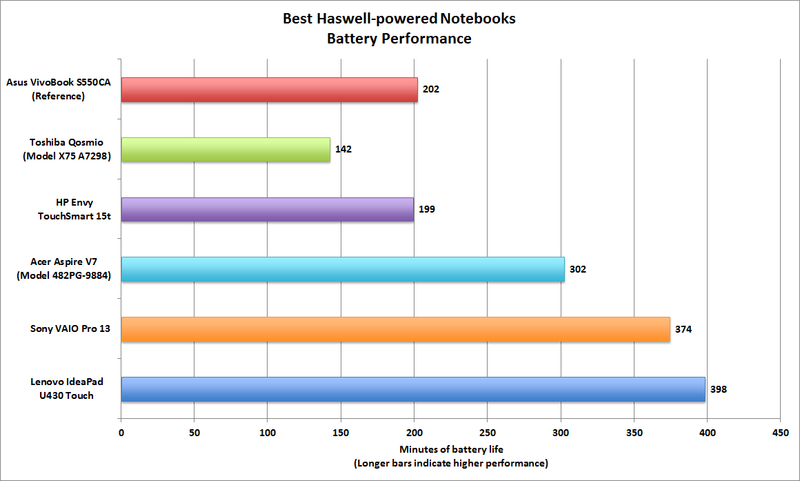 Lenovo’s IdeaPad U430 Touch is nearly twice as powerful as our reference notebook. Lenovo clearly had to hold back on some features to hit the $700 price, and the 14-inch display is one of them. The touchscreen panel is plenty bright, and it delivers very good image quality, but its resolution is limited to 1600 by 900 pixels. 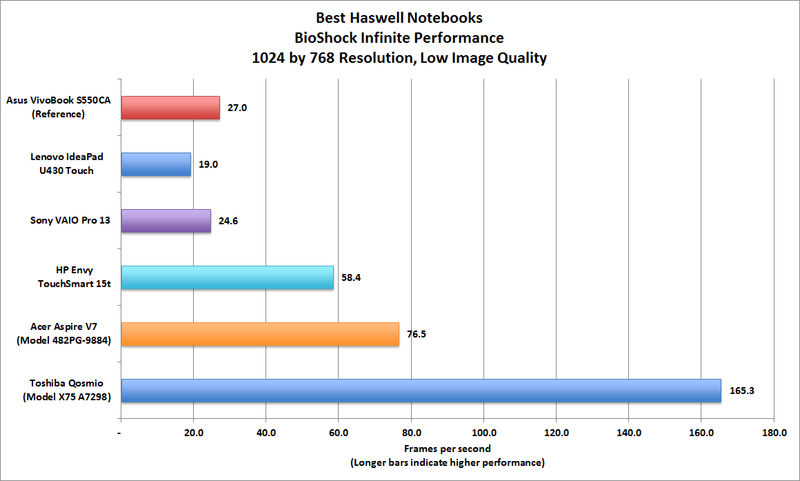 Still, that’s better than the 1366-by-768-pixel resolution that many of its competitors offer. 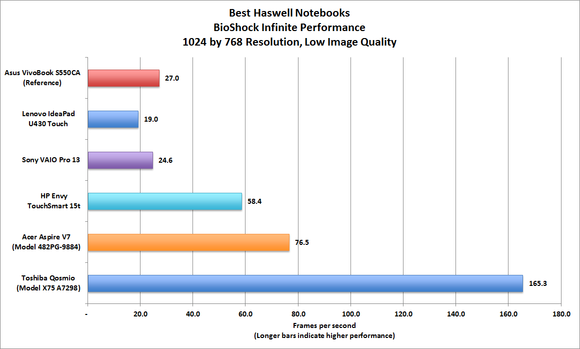 Another drawback is that this computer relies on the GPU integrated into its Core i5 CPU, so you can’t expect to do much hard-core gaming: Among the five laptops in our testing group, the U430 posted the slowest performance on BioShock Infinite, even with the resolution reduced to 1024 by 768 pixels and the visual quality set to low. Intel's integrated graphics processors are much better than the GPUs in its third-generation Core processors, but you'll still need more power than that if you want to play games. The U430 is equipped with a 500GB mechanical hard drive that spins its platters at a leisurely 5400 rpm. A solid-state drive—or at least an SSD cache—would have produced much better performance, but Lenovo would have had a hard time reaching such a low price with either of those features. You’ll find two USB 2.0 ports on the right side of the computer, along with an SD Card reader and the power connector. Battery life of 6 hours, 38 minutes is an impressive stat. Lenovo placed the sole USB 3.0 port on the left side, along with a headset jack, an HDMI output, and a wired gigabit ethernet port. Wireless networking and Bluetooth come courtesy of Intel’s dual-band Wireless-N 7260 chipset (which also supports Intel’s WiDi wireless video-streaming technology). Stereo speakers on the bottom of the chassis deliver surprisingly clear highs, but they’re almost devoid of bass response. Note: This review is part of a roundup of the 5 best Haswell notebooks as of September 2013. This is one of the most affordable Ultrabooks we’ve seen, and the compromises Lenovo made to get there are not showstoppers by any stretch.